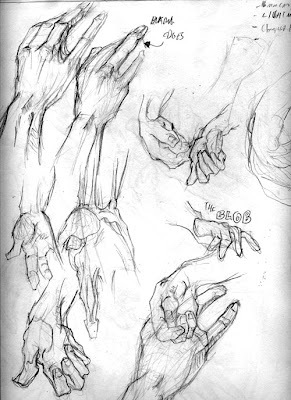 For the last week I've been trying to get a better understanding of hands. For the most part I've avoided them up till now, fully realizing that they're the second most expressive part of the body after the head. In fact, most people know how to control the expressions of their face, so what you're getting is the lies they've figured out how to announce to the world. Hands, on the other hand, (pun, very much intended) are constantly fidgeting or facing outwards, or gripping onto something nervously, giving exactly how a person actually feels. At Animation Mentor they talked about how if you take the body away from a figure, leaving only the head and hands you can see the entire range of expression. If, instead, you take away the hands and the head, leaving only the body, you have no idea what's going on. 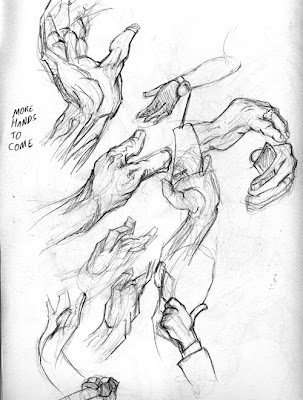 So I've realized for a while hands are important, and finally decided to do something about it. 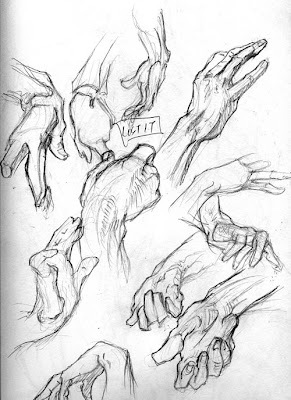 Here are some hands I've drawn in the past, almost entirely from reference. The next step is doing it from my imagination. In an effort to draw the hand as much as possible, I decided to do a short animation of a hand, forcing me to push out 38 drawings of a hand. After finishing with Vilppu, I turned to Bridgeman as a reference guide to the anatomy. I started copying some of the drawings out of his book, and then read through the section. One of my favorite things that he talks about is comparing the arc of the hand to the arc of the body. There's one side with the smooth arc of motion, and the other has the acordianesque folds. He starts with six lines-one for the smooth path of motion, another two to indicate the folded side, a line for the arc of the thumb, another for the index, then the middle, and then one for the pinky. He builds on top of that. I copied a bunch of his drawings, attempting to mimic his technique and understand exactly his process, and then went on to looking at random hands scattered throughout Rolling Stone, and drawing those. I'd draw from the magazine, then shift to my imagination, realize how far I have to go, and then shift back. Then I decided a good way to force myself to draw a lot of hands is through creating an animation of a hand. I taped my hand and used that reference, creating this 38 frame animation. It's far more an excuse to draw a hand 38 times then it is an excuse to create an animation. In the process I picked up a few things. I realized the importance of the angle of the hand, specifically in relation to the angle of the wrist. Finding that angle was the first thing I looked for, akin to finding the angle of the head by looking at the ear in relation to the eye, and the angle of the jaw line. For the hand, I used the knuckle line, or the fold lines if facing the palmar side. The second lesson I took away was the contrast between the thumb and the leading finger. In nearly all hand positions there's a single finger leading the motion, many times the index, and the thumb often is at an almost perpendicular motion to that key finger. It's not always the case, but getting that contrast between the leading finger and the thumb creates a nice dynamic. I'm still working on the underlying anatomy, but my understanding is improving, and I have a good framework to think about the sketches as I practice. Now it's just a matter of plugging away at this till I have it down.